The first report that analyses both quantitative and qualitative data on the ecosystem where transformation happens: Burning Man and transformational festivals. From a family picnic gathering of a summer solstice celebration in Baker Bay San Francisco, to a 70,000 people temporary society experiment, Burning Man is the most remarkable transformational festival in the world. Affecting art, media, innovation, and culture of the western world and its market. 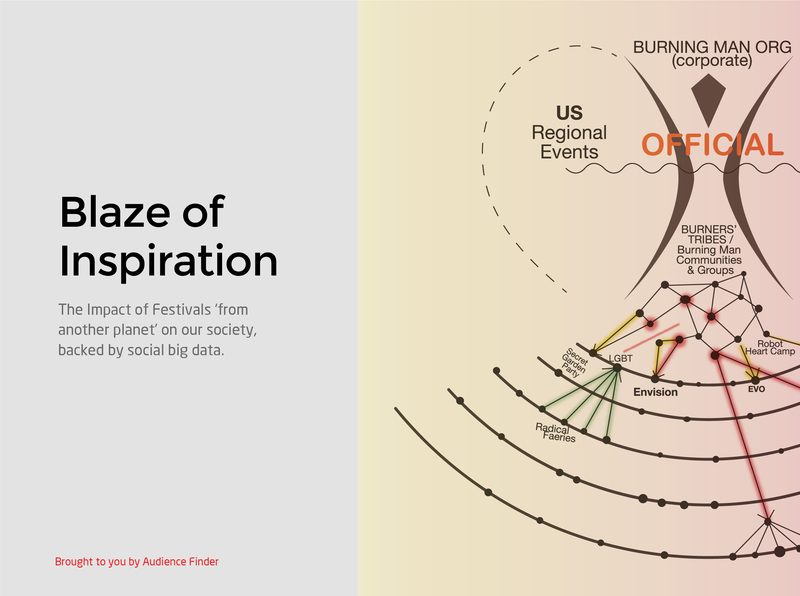 Big Data Set: tracking millions of posts from communities, groups, tribes, influencers, brands, organizations, events, official and unofficial channels that constitute the ecosystem of Burning Man and transformational festivals, it’s the first big data source of analysis in the field. Complexity made accessible through an innovative multilayered analysis process, that tracks the research queries across areas of meaning such as art/creativity, experience design, community building, networked societies, ancient and contemporary rituals, tribalism. Buzzed Topics: 'Black Rock City or Silicon Valley? Technology and innovation at Burning Man'. This focus covers the relationship between Burning Man and the tech industry. The first word cloud in the field: it generates and evaluates a content analysis of big data regarding user-generated conversations. The word cloud gives readers the first ever qualitative analysis of actual content from: communities, groups, tribes, influencers, brands, organizations, events, official and unofficial channels in the field. It’s for people that want to go beyond the gossip and deep dive into the most reliable content analysis on Burning Man and transformational festivals. We sampled and analyzed the most performing content across hundreds of millions of data, so that the sample, generated by visibility score, could be representative of the whole big data set, yet could give you qualitative insights. Community Study: It focuses on the web-tribe of Burners. It answers the question, "Who are the citizens of Black Rock City?" Innovative Visions that come from many starting points and engage theories from scientific fields such as physics and psychology, as well as social sciences and anthropology. Unearthed voices of experts, influencers, and protagonists in the field. Includes an individual use license. Get 3 unique report licenses. Get 10 unique report licenses. A private Q&A Google Hangout session between Alessia Clusini and your company. Notes and the dataset Alessia gathered in writing the report. Get 100 unique report licenses. A private Q&A Google Hangout session between Alessia Clusini and your organization. A custom big data analysis of a segment (topic or query) in the field. With a deeper insight on audiences, interests, behaviors, key influencers and all the relevant data. Custom social big data analysis on the whole field. With a complete insight on audiences, interests, behaviors, key influencers and all the relevant data. New audiences in the field. Reach, engagement, and sentiment for any kind of content/brand/festival/stakeholder. Key influencers and reputation of any topic across the whole dataset. The team working on your cause/brand/topic of interest/goal.